"You Touch My Hot Line"
(1976) "I Feel Like I've Been Livin' (On the Dark Side of the Moon)"
"Disco Inferno" is a 1976 song by The Trammps from the album of the same name. With two other cuts by the group it reached number one on the Billboard Hot Dance Club Play chart in early 1977, but had limited mainstream success in the U.S. until 1978, after being included on the soundtrack to the 1977 film Saturday Night Fever, when a re-release hit number 11 on the Hot 100. It was also notably covered by Cyndi Lauper on the A Night at the Roxbury soundtrack and Tina Turner on the What's Love Got to Do with It soundtrack. The refrain is not to be confused with the saying "Burn, Baby, Burn" which was used to refer to the Watts Riots. The song was originally recorded by The Trammps in 1976 and released as a single. It was inspired by a scene in the 1974 blockbuster film The Towering Inferno in which a discotheque is caught in the blaze. According to Tom Moulton, who mixed the record, the Dolby noise reduction had been set incorrectly during the mixdown of the tracks. When engineer Jay Mark discovered the error and corrected it, the mix had a much wider dynamic range than was common at the time. Due to this, the record seems to "jump out" at the listener. With "Starvin'" and "Body Contact Contract", it topped the U.S. Disco chart for six weeks in the late winter of 1977. On the other US charts, "Disco Inferno" hit number nine on the Black Singles chart, but it was not initially a significant success at pop radio, peaking at number fifty-three on the Billboard Hot 100. "Disco Inferno" gained much greater recognition once it was included on the soundtrack to the 1977 film Saturday Night Fever, this time in extended form, running nearly 11 minutes. Re-released by Atlantic Records, the track peaked at number eleven in the U.S. during the spring of 1978, becoming The Trammps' biggest and most-recognized single. Later, it was included in the Saturday Night Fever musical, interpreted by the 'DJ Monty' in the "Odissey 2001" discothèque. The song also became an unofficial theme song for former New York Yankees outfielder Bernie Williams. It was often played at old Yankee Stadium while the scoreboard and video systems displayed the phrase "Bern Baby Bern", a play on the song's refrain and Williams' first name. In 1996, "Disco Inferno" was included on the soundtrack to the cult comedy film Kingpin and featured in two pivotal scenes in which Roy Munson (played by Woody Harrelson) confidently strolls into a bowling alley. The song was also used in the trailer to the Adam Sandler comedy Bedtime Stories. In 2006, the extended version was featured on a remastered version of the Ghostbusters soundtrack. On September 19, 2005, "Disco Inferno" was inducted into the Dance Music Hall of Fame. (1993) "Why Must We Wait Until Tonight"
Tina Turner covered the song in 1993 for the What's Love Got to Do with It soundtrack and it charted at number twelve in the UK Singles Chart, 4 places higher than The Trammps' version (number 16). The single included remixes by The Beatmasters. Cyndi Lauper performed this song live for the first time at New York, Bryant Park on June 21, 1998. In the Billboard magazine dated May 16, 1998 in the "Dance Trax" column, there was a story on remixers Bobby Guy and Ernie Lake, aka Soul Solution: "They are working with Cyn on a chest-pounding rendition of 'Disco Inferno'. The cut will be featured on the forthcoming soundtrack to A Night At Roxbury." Although the original release date of the maxi single was August 3, 1999, it was distributed from July 24 in some regions. The single was officially released in the U.S. on December 16, 1999. Lauper performed it at many shows around the time of its release. Players Association covered the song as a single release in 1977. Dread Zeppelin covered the song on their 1992 album, It's Not Unusual. The Bobs covered the song on their 1994 album, Cover the Songs Of. Age of Chance performed a fast and noisy version on their 1986 mini-album Beneath the Pavements the Dancefloor/Crush Collision. Australian singer Marcia Hines covered "Disco Inferno" on her 2006 album, Discothèque. System of a Down are sometimes using their version of "Disco Inferno" as a live intro for their song "Psycho". Fast Eddie sampled "Disco Inferno" on his "I Want You, Girl"
Madonna performed her vocals from "Music" over an instrumental version of this song on her 2006 Confessions Tour creating the mash-up "Music Inferno". In August 1998 UK dance act Baby Bumps released their song "Burning", essentially a modern remake of "Disco Inferno" which covers that song's intro riff and chorus looped over a modern house beat, although the recorded vocals were much more in the style of Tina Turner's version. It reached No.17 on the UK Top 40. Punk icon John Otway and Steps songwriter Barry Upton used the song as the backing for John's 2nd Top Ten Hit Bunsen Burner. A version of the song recorded by The Earl Young Band was included in the video games Dungeon Keeper 2 and Bulletstorm. In the Shrek 2 animated short Far, Far, Away Idol, Donkey (Eddie Murphy) is shown singing "Disco Inferno", but has his rear set on fire as Dragon performs with him. The song was hummed by character David Brent during his infamous dance in the TV series The Office. The recording by The Trammps was played in the 1997 film Donnie Brasco and 2004 film What the Bleep Do We Know!?. Night Fever (another song from Saturday Night Fever movie soundtrack, performed by the Bee Gees) and Disco Inferno appeared and were included in the soundtrack of the 1999 movie Mystery Men. The Trammps' version was featured in a mashup mix in DJ Hero, alongside Rihanna's "Disturbia". In The Simpsons, season 13, ep. 10, "Half-Decent Proposal", The Trammps' version was featured in a reenactement of Marge's prom during the 70's. The song was performed by Mercedes Jones (Amber Riley) in the 2012 Glee episode "Saturday Night Glee-ver." The Trammps' version appeared on the Grand Theft Auto IV expansion pack The Ballad of Gay Tony. The Trammps' version is danced to by Mari and Sadie in the film Little Voice as a celebration, in Mari's living room. In the TV series Everybody Loves Raymond, The Trammps' version played on the stereo while Raymond and Robert did a photoshoot in Raymond's basement. The lyrics are read out by fire safety officer Keith Lard in the first series of Phoenix Nights, thinking they describe a real incident. The Trammps' version appeared on the videogame Dance Central 3 represented by Miss Aubrey (Lu$h Crew). The Trammps' version is heard on series 4, episode 4 of the British teen drama Skins and also on Season 3, Episode 2 of Scandal. The Trammps' version is heard in the background of a scene in the movie Ghostbusters. Appears in the fourth episode of the Italian crime series Romanzo Criminale. The first piece of downloadable content for the Dante's Inferno videogame, entitled Dark Forest, includes an additional "Disco Inferno" costume, a novelty piece in the style of polyester disco fashion wear inspired by The Trammps's song. The Trammps' version is heard in a scene in the movie Talk Radio. The song is featured in the film Hobo with a Shotgun while the film's villains fire a flamethrower upon a school bus full of children. ^ "The Trammps Billboard singles". ^ Dys, Andrew (March 8, 2012). Disco Inferno' singer Jimmy Ellis of Rock Hill dies at 74"'". ^ "Disco Inferno Lyrics by Cyndi Lauper - Night At The Roxbury Soundtrack Lyrics". Lyricsondemand.com. Retrieved 2014-06-28. 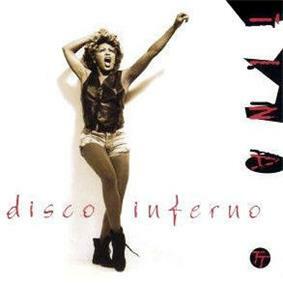 ^ "Disco Inferno Lyrics - Tina Turner". Sing365.com. Retrieved 2014-06-28. 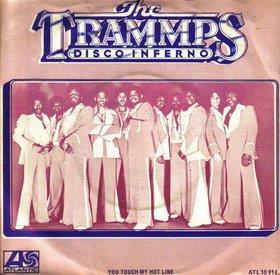 ^ """DeepSoul: The Trammps - "Disco Inferno. DeepSoul.com. Retrieved June 3, 2012. ^ "Bern Baby Bern: Bernie Williams' Burning Desire for Baseball Relit". Bleacher Report. 2009-03-28. Retrieved 2014-06-28. ^ "Ghostbusters: Alternative Rock Music". Amazon.com. Retrieved 2014-06-28. ^ "Trammps Frontman Jimmy Ellis of Disco Inferno Fame Dies | E! Online UK". Eonline.com. Retrieved 2014-06-28. ^ "Ultratop.be – Tina Turner – Disco Inferno" (in Dutch). Ultratop 50. Retrieved October 6, 2015. ^ "Hits of the World" (PDF). Billboard. Prometheus Global Media. September 25, 1993. Retrieved October 6, 2015. ^ "The Irish Charts – Search Results – Disco Inferno". Irish Singles Chart. Retrieved October 6, 2015. ^ "Nederlandse Top 40 – week 47, 1993" (in Dutch). Dutch Top 40 Retrieved October 6, 2015. ^ "Charts.org.nz – Tina Turner – Disco Inferno". Top 40 Singles. Retrieved October 6, 2015. ^ "Tina Turner: Artist Chart History" Official Charts Company. Retrieved October 6, 2015. ^ "Jaarlijsten 1993" (in Dutch). Stichting Nederlandse Top 40. Retrieved October 12, 2015. 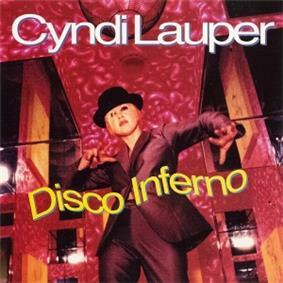 ^ "Disco Inferno by Cyndi Lauper | MTV". Vh1.com. 1999-08-03. Retrieved 2014-06-28. ^ "Age Of Chance - Beneath The Pavements The Dancefloor (Vinyl) at Discogs". Discogs.com. Retrieved 2014-06-28. ^ "Age Of Chance - Crush Collision at Discogs". Discogs.com. Retrieved 2014-06-28.